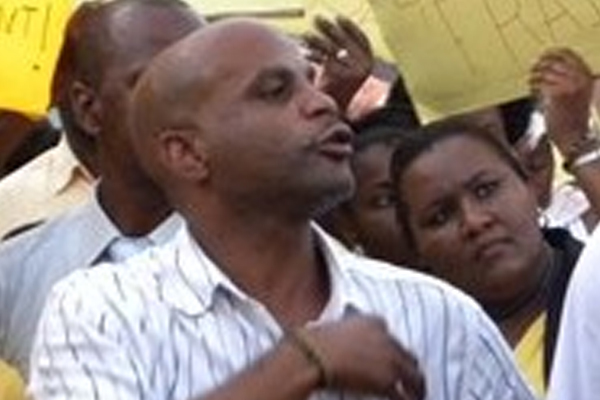 Basseterre, St. Kitts (CUOPM) – Last week’s despicable public and blatant harassment and act of intimidation by former Political Leader of the People’s Action Movement (PAM), Mr. Lindsay FitzPatrick Grant, when he followed the Speaker of the National Assembly, the Hon. Curtis Martin from the St. Kitts-Nevis-Anguilla National Bank though Independence Square, has enraged the people of St. Kitts and Nevis. So much so that several women who witnessed the public harassment came to the defence of Speaker Martin and stopped Grant, a lawyer, in his tracks. Mr. Grant and a few persons had followed the Speaker through the Square and at the entrance of the Immaculate Conception Catholic School to take his daughter for lunch. The Police in its statement, reminded the general public, including Mr. Grant, who is a lawyer, that this activity is an offence, guided by Section 4 of the Prevention of Crime Act, Chapter 4.26 of the revised Laws of the Federation. (c) molest or obstruct any person in a manner defined by this section with a view to coerce such person; commits an offence against this Act, and shall be liable to a fine not exceeding one hundred and fifty dollars, or to be imprisoned for any term not exceeding three months. (c) if he or she watches or besets the house, or other place where such person resides, or works, or comes on business, or happens to be, or the approach to such house or place, or if, with two or more other persons, he or she follows such person in a disorderly manner in or through any street or road. (3) Nothing in this section shall prevent any person from being liable under any other Act, or otherwise, to any other, or higher, punishment than is provided for any offence by this section, so that no person be punished twice for the same offence: Provided that no person shall be liable to any punishment for doing, or conspiring to do, any act on the ground that such act restrains, or tends to restrain, the free course of trade, unless such act is one of the acts hereinbefore specified in this section, and is done with the object of coercing, as hereinbefore mentioned. Mr. Grant, along with the leader of the PAM/PLP, Dr. Timothy Harris and some 12 persons have been protesting the Speaker’s decision to await the hearing and ruling of the High Court in a matter of the Motion of No Confidence placed in the Court by Leader of the Opposition, Hon. Mark Brantley, who has been conspicuously absent from the demonstrations including those for which police permission has been granted. Although the substantive matter is still to be heard, a High Court judge has ordered that civil action filed by the opposition legislators would be allowed to continue against the Speaker, the Hon. Curtis Martin. He also ordered that the other defendants, including Prime Minister the Right Hon. Dr. Denzil L. Douglas and members of his Cabinet, be removed as parties to the originating motion as there was no evidence that Dr. Douglas or his ministers had prevented the Speaker from having the motion tabled. Prime Minister Douglas said his administration would await the outcome of the court ruling on the Motion of No Confidence. The Government continues to enjoy a majority in the National Assembly with 8 of the 15 parliamentarians on the Government Benches. The National Assembly has convened six sittings and 20 Bills including the Budgets for 2013 and 2014 have been passed in the lawmaking body.